Today I am proud to welcome a fellow loss mom and friend Amanda Hoyt. She started Light the Night with Love with Francesca Cox. 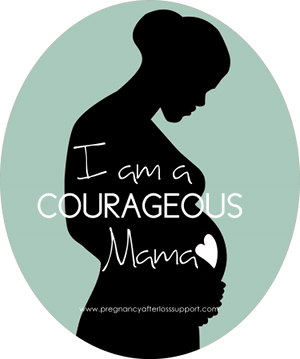 Amanda also offers comfort to bereaved parents through her graphics Facebook page. Please read her story as the work she does touches MANY. Including me! 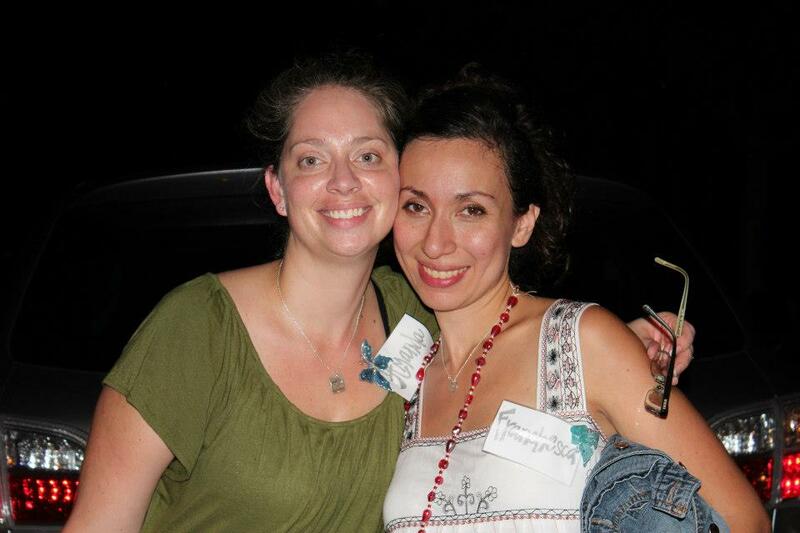 Thank you, Lindsey, for your blog and the obvious time and heart you put into each and every post. Not only does your love for Nora ooze from each post, but you always try to offer up some way to help others in their grief. Thank you for what you are doing for the loss community in the name of your sweet girl. 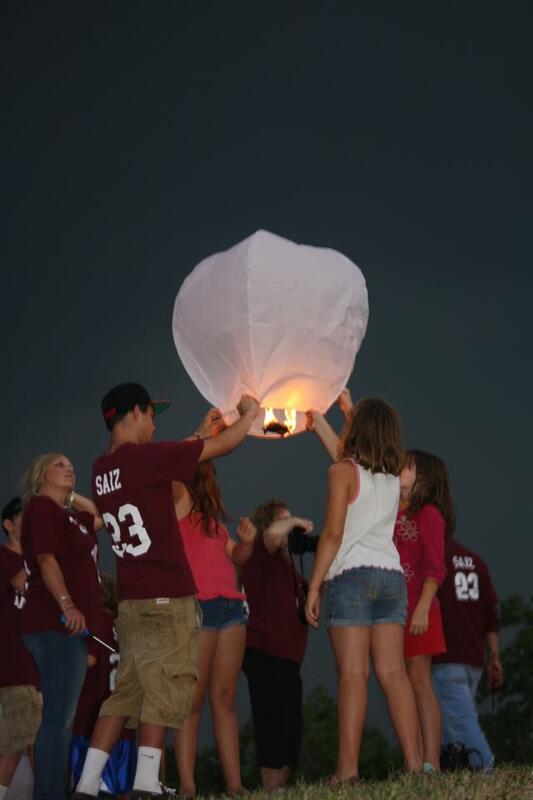 In 2012, inspired by the scene in the movie “Tangled”, Franchesca Cox wanted to release sky lanterns up to Heaven to honor her precious Jenna Belle who went to Heaven in 2009. While chatting one day in July, she asked if I'd be interested in helping her organize an event for Baby Loss Moms everywhere. With about 5 weeks to prepare, we organized an event neither of us could fathom would ever be as far reaching and beneficial to loss families, as it is. So was born, "Light the Night with Love." 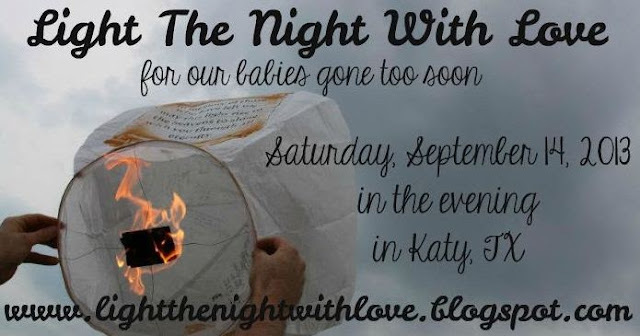 On September 15, 2012 at 7pm, Baby Loss Moms, their families and friends gathered at Mary Jo Peckham Park in Katy, TX to release sky lanterns up to Heaven to remember the babies gone too soon. The event was so far reaching, so well received and so inspiring for Fran and I. We released over 200 sky lanterns in memory of over 350 angels from all over the world. Over 100 grieving the loss of little ones joined us that day (in real life) as so many hundreds more joined us in spirit. We were beyond blessed to have received over 80 sky lanterns that were donated for the event. We swear that Baby Loss Moms are the most generous people out there! We SO wished that all loss families could join us in real life, but since it was impossible, we took tons of pictures and video. The night of the event, after saying our goodbyes to new and old friends, Fran and I knew in our hearts that we had to have an event like this again - annually! 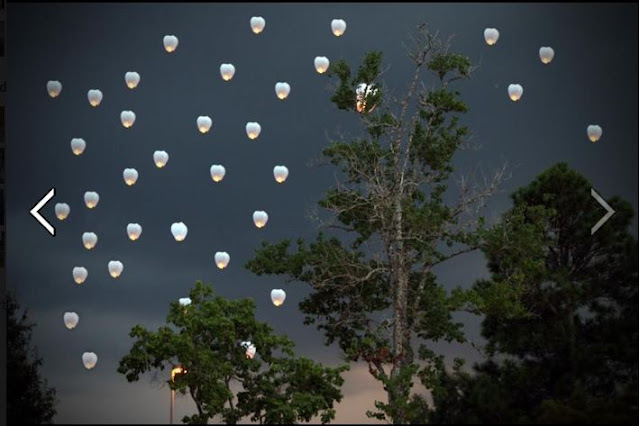 This year, we have reserved the pavilion at the same park and are still accepting names to be written on sky lanterns to release to Heaven on September 14, 2013 in the evening. Currently we have almost 700 baby names submitted and over 47 families who plan to attend the event. 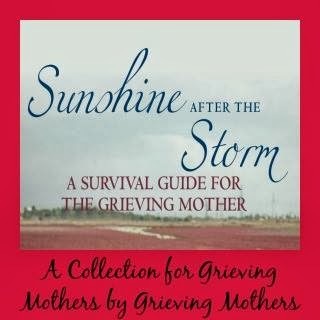 We have three local loss moms (including myself) who will speak about loss, love & hope. The message we want other loss families to learn by hosting this event is that there are others out there who care, remember your child and want to honor your child who has gone before you. 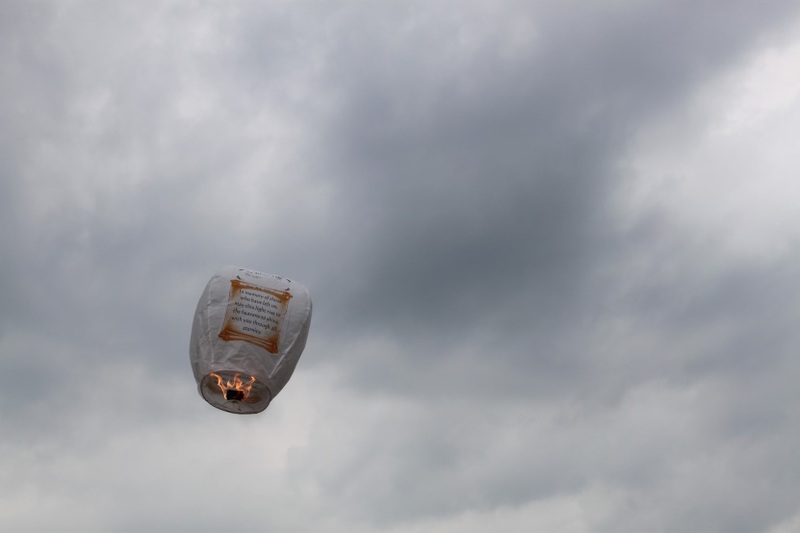 We want you to feel welcome and know that this day was created with all of our children in mind – and the visual you can get if you picture all of our babies in Heaven watching us release sky lanterns in their memory – is priceless. I lost a child early on in pregnancy in March of 2008 so I’ve been involved in the loss community for the past 5 years. We tried to conceive for 13 months a few years after my first child was born and finally ended up pregnant. What a glorious day it was to finally see that positive pregnancy test! After a high risk and tumultuous pregnancy the first time and having given birth to a perfectly healthy girl 41 weeks later, we never once though that I could lose this child. Nine and a half weeks into the pregnancy though, I did lose the baby. Talk about devastating. I don’t know how I made it through those early months but after reading a book that suggested that I name my baby in order to help me grieve the loss of the real child that I had carried, my soul directed me to name my child Noah Joel, which means “rest; peace” and “The Lord is God.” My heart bleeds for other families enduring loss – at all stages of life – but especially when it’s a child. Knowing how badly my heart has been broken after losing my 2nd child to early miscarriage and the sadness my firstborn has endured knowing that she lost a sibling drives me to be there for others in their darkest hour. I want others going through the loss of a child to know that they are not alone. I try to encourage those enduring heartbreak and have found a sort of ministry in that by making graphics (along with my sweet friend Melanie Yvette Rodriguez who lost her first child to miscarriage just 4 days before I did in 2008) for loss families in memory of their children gone too soon, over at https://www.facebook.com/babiilove.graphicz. Making graphics using photos I’ve taken (or graphics “donated” to us from friends and family) by adding a quote, verse or personalized saying along with an angel baby’s name makes my heart heal just a bit more. Knowing that I’m using my creativity and soul to bring an angel baby’s name to “life” is truly an inspiring and blessed event for me. I am so honored to remember (I keep a daily calendar of birthdays, angelversaries and due dates and commemorate each baby on their date(s)) and produce such an item that for some loss parents is the only way they will ever see their baby’s name written. Joining Fran in co-hosting this lantern release each year has allowed my heart even more healing. Knowing that I’m helping to organize an event to honor other families who have lost; in memory of Noah Joel & Jenna Belle in Heaven; brings me great comfort and peace. Over the past year, we have been sent many messages of encouragement and thankfulness for the Light The Night With Love event. Finding out for the first time how instrumental the event was to some families’ healing over the loss of their child floored Fran and myself. We had no idea that we were truly presenting a light in the darkness for some. We’ve heard specifically from two mamas that the event was actually a turning point in their grief process. Talk about tears. Reading this blog from our friend Kessi (who lost her precious son Jacob in April of 2012) and receiving an email from another mom (who lost her sweet son Abel in November 2012) stating that after seeing pictures and videos from last year’s event she “immediately felt Love and Hope. Instead of the sorrow of death, I felt the Joy of a Life” pushed both Fran and I to tears. We strive each day to let other loss families know that we care and to hear that at least two grief journeys have been helped through this event…Wow. We really are speechless. All in all, we want families to know that our goal is to honor your children's memories. In doing so, Fran and I feel incredibly blessed to be a part of the community no one would ever want to be in. We love you all and are honored to be a part of your lives. If someone reading this would like their baby (or babies) to be remembered on September 14th by having a sky lantern released to Heaven, please sign up here. If you are local to the Katy/Houston, Texas area, we would love to have you join us for the event. Please notate on the sign-up form that you plan to be there. 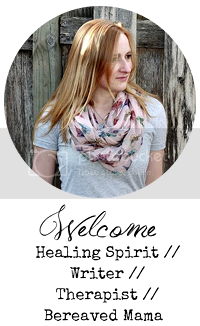 Thank you again for having me on your blog, sweet Lindsey. 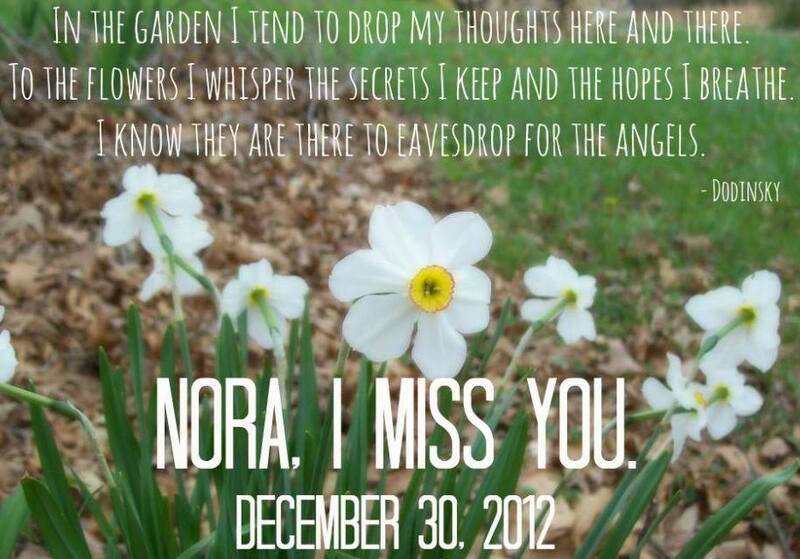 I can’t wait to release Nora’s lantern for you. Amanda Hoyt lost her only son, Noah Joel, to an early miscarriage in 2008 and refuses to lose her faith. She is a working wife & mom to two little girls on Earth. She dedicates her free time to loving on other loss families and encouraging them in their darkest hours. 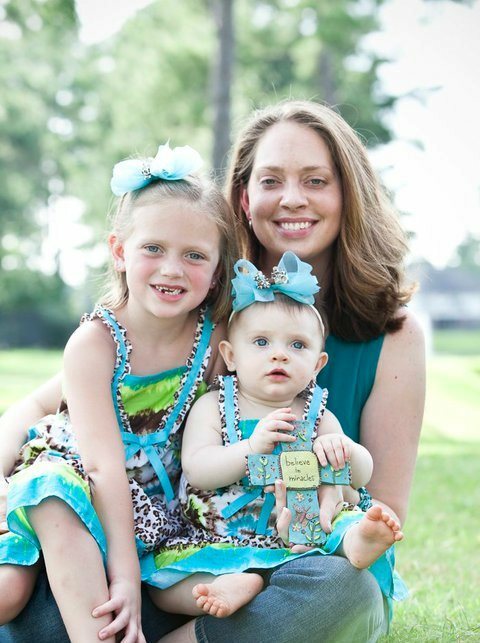 You can read more about Amanda's journey by visiting her blog The Hoyt Family.